Twenty-four-year-old Wilma Rogers wrote American psychiatrist and lobotomy pioneer Walter Freeman this letter at the end of 1954. Rogers had tried numerous medications, including barbiturates, reserpine, chlorpromazine, and stimulants, and attempted psychotherapy with at least six different psychiatrists. Freeman performed her first transorbital lobotomy in early 1954. A few months later, in a heartbreaking letter to Freeman, Rogers shared her feelings of being ‘a spectator, watching a never ending scene of human life, which I am prohibited from ever participating in. It seems so unfair, for I tried so hard for over three years to be cured.’ (Wilma Rogers to WF, 1954.) At her request, a second operation was performed later that year. Yet a cure still remained a distant hope. At first blush, it seems strange that such an eloquent coherent young woman would seek out a third lobotomy. Developed in the late 1930s, and popular until the late 1950s in the United States, lobotomy is a form of brain surgery designed to cure mental illness. Today seen as a stain on the history of modern psychiatry, lobotomy is sometimes invoked as a cautionary tale of medicine gone awry. Its success is often credited to overzealous self-promoting physicians, who, ignoring evidence to the contrary, were blind to lobotomy’s detrimental effects. Most popular accounts of lobotomy focus on Freeman, depicting him as anything from irresponsible to deranged, as he worked tirelessly to promote the procedure he had developed. Freeman drove his van, nicknamed his ‘lobotomobile’, throughout the country to perform procedures in distant hospitals and follow up on former patients. 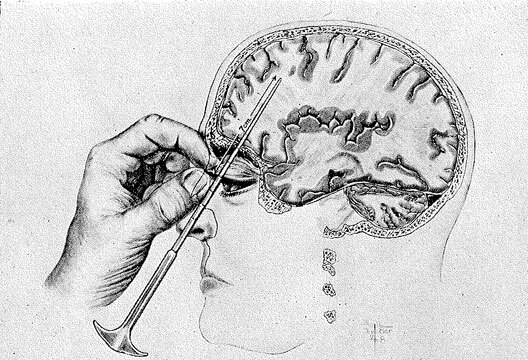 Freeman also developed the notorious ‘icepick’ lobotomy, which involved inserting a sharp instrument through the eye sockets in order to sever brain fibres in the prefrontal lobes, thus transforming lobotomy from major brain surgery to potentially an office procedure. (see Braslow, 1997; Pressman, 1998, Shorter, 1997). Yet this emphasis on the bizarre or seemingly irresponsible behaviour of individual doctors in order to explain the soaring popularity of lobotomy in the United States fails to take into account how lobotomy was experienced by patients and their families. Focusing on the correspondence between Walter Freeman and his patients, this article examines how patients and their families chose to interpret the results of what is now seen as devastating procedure.I argue that patients, families and their physician, Freeman, shared similar views of the goals and results of lobotomy. Freeman and his patients both prioritised the ability to return to ‘productive’ lives following the procedure. Patients’ employment status was a central part of Freeman’s post-operative evaluation, and he would track patients’ ability to perform remunerated work or housework on a ‘life-chart’ he devised. Productivity, even if at a level significantly below the patient’s pre-morbid abilities, was seen as tantamount to a successful procedure (Raz, 2010). Patients and their families also privileged the ability to work, beyond any change in the patient’s psychiatric illness or subjective well-being. Freeman actively sought information about patients’ employment status, and patients and their families were eager to oblige. One patient described her improvement, noting that she had ‘calmed down quite a bit’, emphasising that she did her ‘own house-work – except on Fridays when someone comes in for general cleaning’ (Veronica Marks to WF, 1956). Another patient’s daughter described in detail her mother’s quotidian existence, highlighting her improvement. ‘Her life’, the daughter explained, was a ‘daily routine of handwork, a few household chores, eating the three meals and snacks in between time and going to bed pretty early life’, adding that she had ‘developed into a pretty reliable dishwasher’ (Daughter of unidentified lobotomy patient to WF, 1955). A patient’s husband described how ‘remarkably well’ his wife was doing. She performed ‘her housework very well and has been an indispensable part of the home,’ and had ‘done a very acceptable job in the preparation of meals and the children’s lunches for school which cannot be measured in dollars and cents’ (Leila May’s husband to WF, 1957). An additional axis that guided patients’ and families’ interpretations of the results of lobotomy was the alleviation of visible suffering. This theme appears in numerous letters from family members. A young patient’s father described his son’s abysmal post-operative condition in neutral tones, adding that ‘he has, of course, no emotional reaction whatsoever, so that he is spared of any mental torment’. His son was institutionalised, and had developed a seizure disorder as a complication of the surgery. In one instance, he had seized and fallen on a heating pipe, leading to severe burns; a subsequent attempt at a skin graft was unsuccessful. Despite these complications, the father reiterated that he and his wife were ‘naturally thankful that he does not have to suffer as he did prior to the surgery’ (Bert Langer’s father to WF, 1955). The alleviation of suffering framed the father’s interpretation of his son’s condition, enabling him to positively view the procedure’s unsuccessful results. Yet his letter was rife with descriptions of what would seem to a modern reader as evidence of ongoing suffering, both physical and emotional. From the father’s point of view, the son’s condition indicated significant improvement. This highlights the interpretive nature of the evaluation of the patient’s post-operative condition. Freeman’s response to the father addressed the procedure’s detrimental effects in a candid matter, admitting that post-operative seizures were one of the reasons he had developed a new surgical technique. He was relieved that the patient did ‘not seem to suffer the torment that he did before he was operated upon’, adding that he hoped that the patient’s ‘misfortune will be turned to some benefit for other sufferers from this tragic disorder’ (WF to Bert Langer’s father, 1956). For Freeman too, the alleviation of suffering was the main goal of the procedure. It provided both the framework by which to interpret the surgery’s results and its justification: the possible alleviation of suffering for other patients. In a different example, Freeman described his interview with a middle-school-aged child, diagnosed with schizophrenia, who was referred to surgery following repeated acts of arson. In assessing whether to perform the procedure, despite what Freeman believed would be a low probability of success, he noted that ‘what impressed me more, however, was the suffering that the boy was undergoing which frequently showed as moisture in the eyes not spilling over into tears and the boy admitted himself that he was tensely [sic] unhappy and that he got no delight in setting fires only an excitement and the thrill of revenge’ (WF to Andre Rolo MD, regarding Jonathan Schultz, 1945). Patients and families saw in Freeman a partner in their quest to seek relief, as we saw in Wilma’s poignant letter. Freeman, who kept in touch with patients and families over decades, was revered by many of his correspondents, and held as an authority on medical manners far beyond the procedure he had performed. Family members asked for advice on marital relations, disagreements with in-laws, and difficulties such as managing post-operative patients’ sexual behavior (see Raz, 2013, pp.85–96). Patients and family members appreciated Freeman’s straightforwardness and accessibility, and some family members even requested advice from Freeman concerning their own personal health situation. This close relationship is surprising, considering the limited amount of time the patients and families had spent with Freeman, the large number of patients he treated, and the great geographical distances between himself and many of his patients. The letters and cards Freeman sent his former patients over the course of decades created a feeling of proximity and warmth. Furthermore, some patients were seen by themselves or their family members to be in such good health that they no longer felt it necessary to continue with regular medical care. Thus Freeman remained the physician best acquainted with their medical background and condition. Former patient Edwin Shore’s sister wrote to Freeman requesting that he fill out the medical paperwork for a retirement application. ‘Edwin has no particular doctor to whom he goes,’ she explained, as he ‘had no serious illness since his mental breakdown’ (Sister of Edwin Shore to WF, 1957). For some patients and families, the lobotomy signified the end of the period of illness and the passage into the realm of health, and Freeman remained the mediator to the world of medicine and its institutions. Freeman’s commitment toward the patients and the restoration of their health seemed so evident to patients and their families that even in cases of an unsuccessful lobotomy leading to disability or death, the families of the patients expressed their gratitude to him. Following a patient’s death after a second surgical attempt, the patient’s sister thanked Freeman and his partner, James Watts, for their ‘concern and interest’ in her sister’s condition. She was sure, she added, that her sister also would have thanked the physicians, ‘if she were able to do so’ (Maeve Ingber’s sister to James Watts, 1948). In his response, Freeman wrote that he and Watts had been ‘greatly disappointed in the outcome’. Yet he added that this had been a ‘situation of extraordinary difficulty where surgery offered the only opportunity for giving her peace of mind’. Commending the sister for her positive attitude toward ‘this unfortunate outcome’, Freeman thanked her for her letter (WF to Maeve Ingber’s sister, 1948). The physicians’ willingness to attempt surgery, and thus provide even a slim hope of cure, was interpreted as evidence of their care and dedication. For the families, this expression of interest and what was seen as a sincere desire to help their loved one was so significant that the results of the lobotomy, even the death of the patient, could be interpreted in a positive manner. For Freeman, lobotomy was a part of scientific progress; he was continually refining and changing his procedure and learning from his observations on patients, sharing these insights with both patients and their families. These in turn felt personally invested in Freeman’s medical success, and in the progress of scientific and medical knowledge, often asking him about his medical practice and plans. Even unsuccessful or botched-up operations became a part of this narrative. A cutting-edge treatment had been attempted, albeit unsuccessfully, and the patient and his family became part of a community that had both contributed to and had taken part in scientific progress. Thus within, rather than despite, the context of a caring and dedicated physician–patient relationship, lobotomy could have been perceived as a valid and efficacious treatment by physicians and patients alike. Furthermore, the acceptance that effective therapeutics often entailed taking risks and undergoing invasive and dangerous procedures enabled lobotomy to be viewed as part of standard medical discourse. In 1956 Wilma Rogers committed suicide by overdosing on barbiturates. She was 26 years old. The letters she sent Freeman, starting in late 1953, do not reveal any source of happiness or pleasure in her life. The two lobotomies she underwent did little to improve her condition, and perhaps even contributed to her decline. Freeman succinctly noted that it was ‘regrettable that the treatment that I administered was not effective in preventing her from killing herself’ (WF to T.E. Cato, 1956, in Wilma Rogers’ file.) We would not be doing justice to Wilma’s sad and short life if we did not address her active role in obtaining and interpreting the different forms of therapy she hoped would promise cure. Listening to these stories, examining the interpretations of medical interventions and evaluating the frameworks, both medical and social, that were drawn on for these interpretations, enables a richer comprehension of the historical riddle that is lobotomy. Braslow, J.T. (1997). Mental ills and bodily cures: Psychiatric treatment in the first half of the twentieth century Berkeley, CA: University of California Press. Lawrence, S.C. (2007). Access anxiety: HIPAA and historical research. Journal of the History of Medicine and Allied Sciences, 62(4), 422–460. Raz, M. (2010). Psychosurgery, industry and personal responsibility. Social History of Medicine, 23(1), 116–133. Raz, M. (2013). The lobotomy letters: The making of American psychosurgery. Rochester, NY: University of Rochester Press. Shorter, E. (1997). A history of psychiatry: From the era of the asylum to the age of Prozac. New York: Wiley.